Adz and myself met and departed Melbourne from the Donnybrook exit Shell Servo at 5am… Yep, there is actually such a time of the day. Drizzly as we headed north in the dark. Rolf was planning to ride up to Sydney later as he had a late night getting into Melbourne the night before. While Max, well at 5am it was still ‘touch and go’ which mode of transport he was using to get to Sydney since his bike was still getting pieced together from a major meltdown. Day broke and the skies cleared to a beautiful sunny early thirties day. 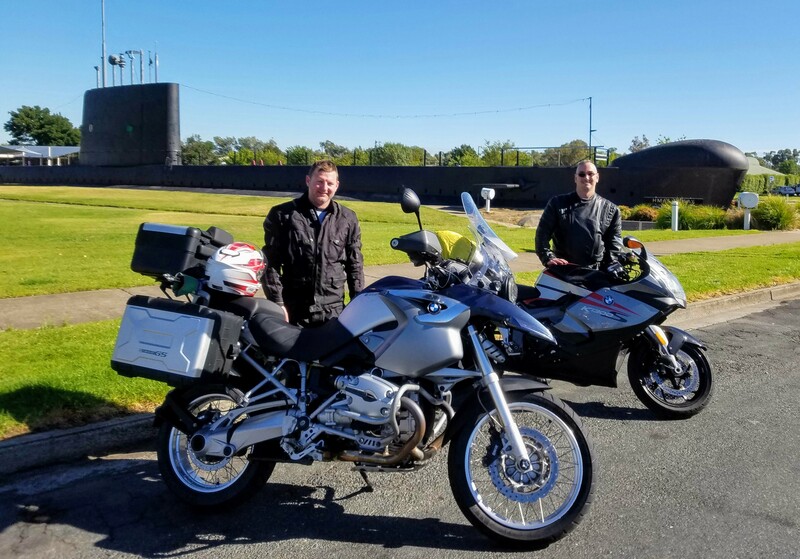 We had a much needed coffee and touristy photos at Holbrook in front of the HMAS Otway Submarine as we engaged a light conversation with some Gray Nomads heading south. Our lunch with just north of Gundagai with more touristy photos at the ‘Dog on a Tucker Box’ after a few stops to stretch in-between. 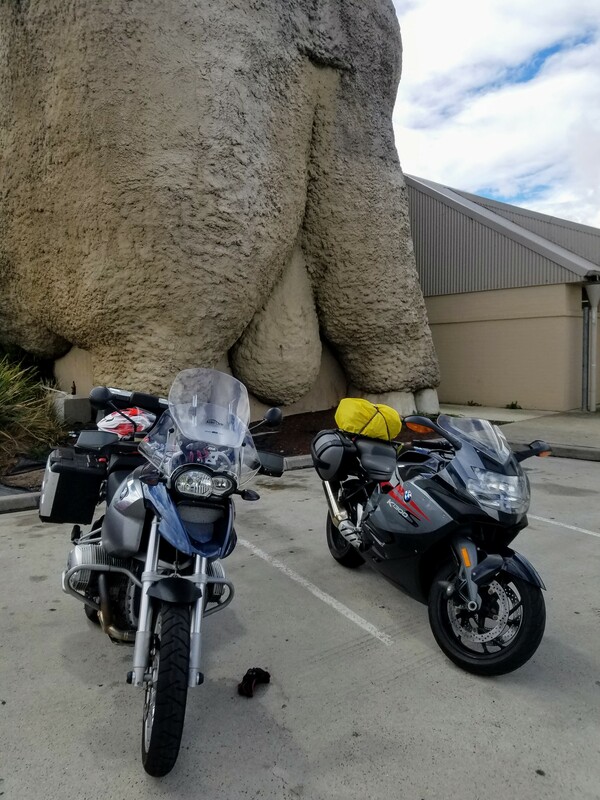 A final refuel and you guessed it, more touristy photos in Goulburn where we parked in the shadow of the Biggest Balls I have ever seen… (‘Big Marino’ Gift Shop and Wool Museum). 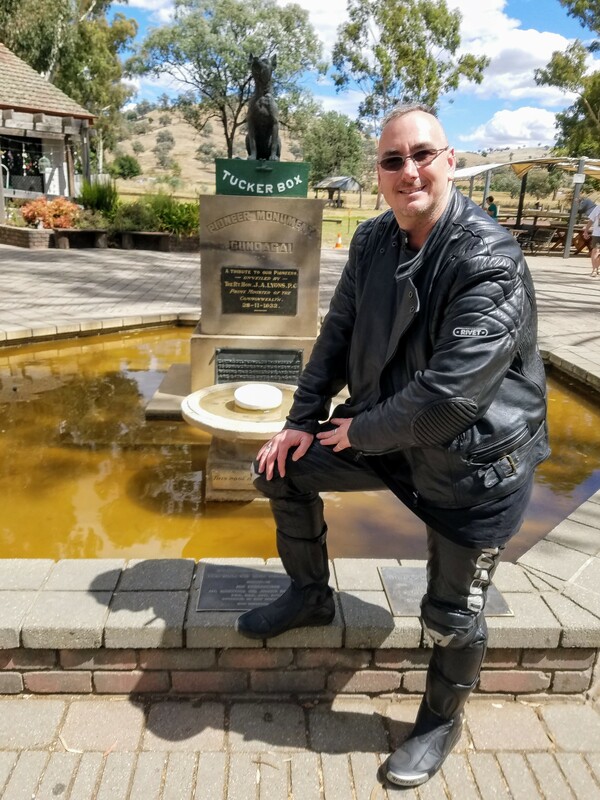 We headed up to the ‘Rocky Hill War Memorial’ Lookout for some picturesque views of Goulburn before us, and the beginnings of a soaking ride thereafter behind us… Yep, it was to be very wet from here on in. A burst water main at Central Station in Sydney sent Google Maps navigation into an electronic ‘Meltdown’ giving us an uninvited tour through the guts of the Sydney CBD during peak hour (laughs… as one of the natives in the Boys on Bikes groups said “Every Hour is Peak Hour in Sydney these days). Added to the congestion woes was a lot of road construction work as they re-lay tracks for the new LightRail system… If only the powers that be in Sydney used their brains like down in Melbourne and didn’t remove their trams in the first place, then getting around Sydney may have been much easier. So, after dealing with heavy rain, peak traffic and pedestrians conditions, continuous traffic detours, busses and taxi’s forcing themselves into normal vehicle traffic lanes rather than using their dedicated Bus Transit lanes, hot, humid and sticky conditions with the engine overheating and traffic not moving, I decided to turn off the engine and let it cool down. When the traffic did finally start to roll, I realised my battery had been drained almost completely by the fan (Bike idling isn’t enough to keep the battery charged up to support the draw of the fan… Mental note made!). I pushed my bike around the block to where our accommodation was, and made an emergency call to John (back here in Victoria). John called RACV who would have been able to help me under his Emergency Breakdown cover if he was also in Sydney as they need to see ID of the Policy Holder, so John decided to take out Breakdown Cover for me, so I was then able to call out the NRMA… who arrived over 2 hours later of me standing near the bike in the rain for that time as Sydney doesn’t permit motorbikes to be parked on footpaths… Did I mention how much I hate Sydney? The NRMA Van finally arrived, jump-started my bike and checks the voltage of the battery. The guy informs me I would need to now ride the bike around Sydney for about 40 minutes to give the battery a decent charge… Yeah But No! Don’t know Sydney well, Dark, Wet and I was really in a bad mood now as it was. Adz and I thought I would just ride it around to where we were parking the bikes and sort it out in the morning. Oh, and Max finally arrived on his rebuilt machine… I’m sure the boom from the sound barrier was going to hit soon after! Adz and I finally got to head out into the Asian Food strip behind our accommodation to get some long awaited dinner, which they were pretty much packing everything up around us while we were finishing up. Max located a BMW Dealer for me and called them to see if they did Battery Replacements and whether it could be done that day (Saturday, where Sydney still acts like a country town and shops close at lunch time). So, after a freakishly fast shower, I off to see if my bike would start, which thankfully it did, and again, I headed out into the Sydney traffic and rain. Only $300 later and a couple of cups of complimentary BMW coffee, my bike was ready to go again, so I headed back and parked the bike up before anything else could go wrong with it. 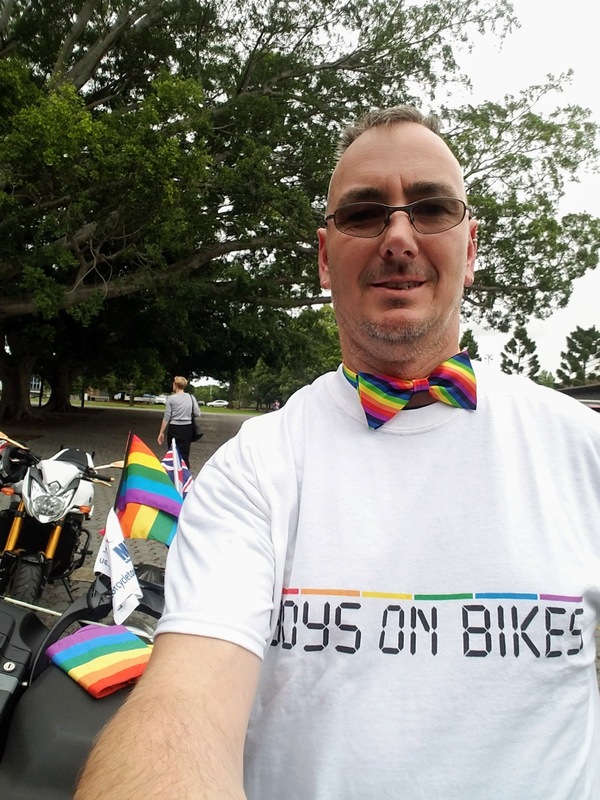 I rested up before Adz and I geared up ready to head over for the assembly with the Boys on Bikes before the parade and the odd light shower here and there while a collection of about 70 bikes from the boys (inc. 4+1 MMT), and I believe there was about 160 DoB. In spite of all the ‘easy kneeler’ compressions Fred Nile does praying for Rain on Mardi Gras, we were lucky enough to have a dry ride through the parade. Better luck next year Freddy Boy… Maybe it’s a sign you’re on the wrong side of History? We were invited to join the BoB’s for a Dinner Gathering at the Bondi Hotel after the parade. As MMT has now participated in Mardi Gras for a number of years, we have gotten to know a number of the BoB members. I was captivated by a hot young guy who caught my attention at the Bondi Hotel and it didn’t take very long for the penny to drop that it was one of my favourite Gay American Singer Songwriters that I follow on Twitter. He was just sitting there alone, so like a shy school-kid I went and introduced myself. We started chatting about how I love his music and follow him on Twitter. I asked if I could get a photo with him, which he obliged. My hands were trembling so much that he took my phone and said “Let me to this, I’m a pro at it”! About 10 minutes later as he was leaving he smile, waved and said goodbye. I knew he was going to be in Sydney, as I said, I follow him on Twitter, but what are the chances that I would just bump into him like that, where I was able to just go and have a chat with him? After dinner, we headed back into the city to get back to our accommodation, and we hit a wall of traffic leaving the Mardi Gras Parade. It took us what felt like ‘For-e-ver’ to go a very short distance. The more I found myself locked in the Sydney Traffic, the more I was saying how fond I was! (Sarcasm detected?). Adz and I decided as it wasn’t raining, and normal Sydnarians would have already arrived at work, it would be safe to venture out for a ride to check out one of the Motorcycle Superstores in the suburb of Auburn some 20kms out, or about 50 minutes riding. As we were playing the part of ‘out of town shoppers in the Big Smoke’, Adz noticed one of the BoB guys, Scott. It ended up being a total talk-fest for what seemed ‘for-e-ver’!, but we did end up buying a few things, so Scott could actually tick it off as providing good customer service! When we departed, we headed south after our (a-hum) little shopping spree so we wouldn’t be anywhere near the CBD as we tried to make our way over for a quick-see of Bondi Beach during daylight hours. Our ‘Google Maps’ (GPS Service) was still experiencing a Meltdown as she was sending us through all manner of back roads, and I’m sure we were directed through ever School Zone with little rug-rats spewing from their gates. Bondi Beach was blowing a gale, and cars in the parking lots were getting a lovely sand-blasting… so we made a short stay of it before we headed back into the city to our hotel. After dark, I headed back into Darling Harbour for some dinner and night photos of the water and skyline. Adz, Max and I headed away from Sydney for some scenic riding down the east coast. It was still raining, surprise surprise… but as we’re not ‘fair-weather-riders’, and the fact that Sydney was getting further away with each kilometre, I was feeling quite liberated. We made our way via the ‘Royal National Park’, which was full of exciting gullies and valleys that NSW coast is known for. A lunch stop in Wollongong at a place called ‘Chicko’s Chickens & Quality Foods’ which appeared to be the best outlet in town, and lunch was delicious. Our destination was Batemans Bay, which although only about 276kms, seemed to be a full days riding. Adz planned a slight diversion to have a quick catch-up with a family friend in Nowra, but Google Maps was obviously having a Moggy and a Lay Down as we were sent in various directions away from where we should have been going. Checked into our accommodation, and then headed out for dinner at the local Soldiers Club (RSL). After dinner, we enjoyed a relaxed walk along the river to at least pretend we were actively working off our meal… and a-hum… Dessert (my, that New York Baked Cheese Cake was Yummy!) before we settled in for the night with a good Star Trek movie that was on TV. Apologies Adz for subjecting you to that! After a great night sleep, I enjoyed a nice 4km return walk along the water front before getting back to prepare for our departure. I thought it was lucky for us that the night wasn’t terribly warm, as the air-conditioner wouldn’t work in our room. As suddenly Max came mincing in while Adz was in the shower saying “Now I’ve stayed in a lot of places in my time, but this is the first place I’ve been where you have to use your room key to turn the air-conditioner on”… Umm, yeah… Doh! So I put the key in the key slot in the middle of the vacant wall nowhere near the air-conditioner and waited for Adz to come out and see if he noticed it room was cooler! Ha ha, yep, a Kodak moment! We checked out, refuelled and set off into yet another rainy morning (Yes, we were still in NSW, so we weren’t expecting the rain to stop until we crossed the Victorian Border). We had planned a stop-over to catch up with DP, Michael Van D, Michael R and his Lovely partner Stephen L for a Coffee… Which ended up being an early lunch in Merimbula where they were enjoying a ‘Classic Car Retreat’, only minus one of the Classic Cars (Michael R’s Mercedes which obviously heard about Max’s Motorbike condition and went a similar way in sympathy)! After our brief lunch date, we continued south and another tourist stop in at Mallacoota where we enjoyed yet another coffee by the sea-side at the local bakery. The weather at this point was much better, as I noted, we were now in Victoria! Then our final leg as we made our way down to Lakes Entrance where I was able to capture some beautiful sunset photos across the estuary and over the sand dunes out into the Tasman Sea. Even though it wasn’t raining, the temperature plummeted and the wintery wind blew up off the coast. Adz was well and truly over it at this point, so just wanted to get himself home, but Max and I decided we would catch up with Craig J for a look-see of the Boy’s new Farm House acquisition and lunch at the Korumburra Hotel before hitting the familiar roads of Melbourne. To sum up the MMT 2017 Mardi Gras tour, would be it was certainly an adventure with loads of challenges. With discussions already started for ideas about heading up to Sydney for the 2018 Sydney Mardi Gras weekend, I would only really say it’s time to suss out alternate accommodation away from the heart of the CBD as many members don’t go to the parties after the Mardi Gras Parade, and the location of the accommodation we have been staying at for the past number of years really is a hassle to get in and out from. Sydney’s CBD traffic is never going to improve. Thanks to Adz for planning the tour, and to Max for arranging our accommodation. I am not even going to ask how you managed to get our stint there so cheap, but I admit he must have been worth it!